Oslo Power-Punkers Wet Dreams debut with self-titled album on Blackpop Records. The album drops on March 28th and follows the previous release “Bad Boy” and latest single “Boogie” which gives a nice little taster to how infectiously raw this record sounds. Described as Motorhead covering The Hives by NME, this is an apt description especially when listening to “Boogie”. It’s got that fuzz driven bass sound made famous by Lemmy and the howling vocals of Pelle Almqvist. 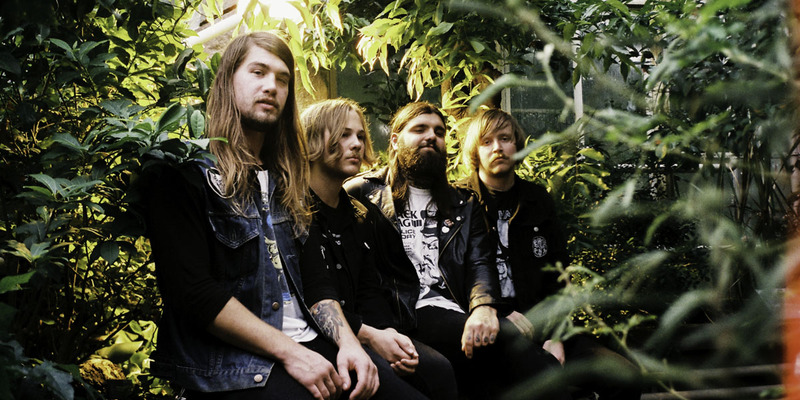 The band is made up with members from FOAMMM, Warp Riders, De Marveles and Death by Unga Bunga and have already played several festivals in the Scandinavian region and garnered a lot of hype. The debut album was recorded by the band themselves and is definitely a fine example of true Punk rock. It’s got all the attitude and is rough around the edges. The songs are both thrashing and melodic in delivery and provide some quite catchy powerpunk choruses. The album kicks off with the track “Band Aid” which addresses themes of self harm, which you would think brings the mood down straight away but by the time you ge to the finale “I Told You/Drugs” you begin to see the true story. The album overall tells the story of the modern social culture, fake bravado and crippling insecurities. However like good comedy it makes light of this in order to create a release for those that tune in. I’d highly recommend this record to anyone who is a fan of good garage rock sounds, fans of The Ramones, The Hives and even the early days of Kings of Leon will enjoy the sound and delivery of these tracks. The only downside to listening to this album is the fact you know it’d sound 10 times better live. Not often do I listen to a new band and am instantly ready to travel to see them live.